Heavy security arrangements have been made and several beaches closed as the leaders of Brazil, Russia, India, China and South Africa meet in the western Indian state for the annual BRICS summit. A large presence of police, paramilitary and army personnel have been deployed in the western Indian state of Goa, which will host the 17th annual Indo-Russian summit as well the BRICS summit over the weekend. The venue for both summits is the Taj Exotica, which is about 27 km away from the state’s only international airport. Tents and defence machinery have been set up on the beaches near the venue by the Indian Army, which is guarding against potential terrorist attacks on the large delegations from the five member countries. Traffic will be completely diverted when the motorcades of the leaders travel on the stretch from the airport to the venue. The beaches near the venue will be closed to the public till Monday, Oct. 17. Vladimir Putin will arrive in Goa at 1 am on October 15 for the annual Indo-Russian summit, which is being held for the first time outside Moscow or New Delhi. Over the past year, several erroneous reports have appeared in the Indian and Russian media over the sale of the S-400 system. Indian newspapers on Oct. 14 reported that a deal for the system is expected to be worth around $6 billion. The countries are also expected to sign deals for three Project 11356 frigates and the setting up of an Indo-Russian joint venture to produce Kamov Ka-226T helicopters. Sources close to the situation tell RIR that the countries are unlikely to sign an agreement for the lease of an Akula submarine. Also on the cards is an agreement for the construction of the 5th and 6th unit of the Kudankulam Nuclear Power Project (KNPP). The leaders are also expected to take part in a foundation-stone laying ceremony (via videoconferencing) for the third and fourth units of the KNPP. 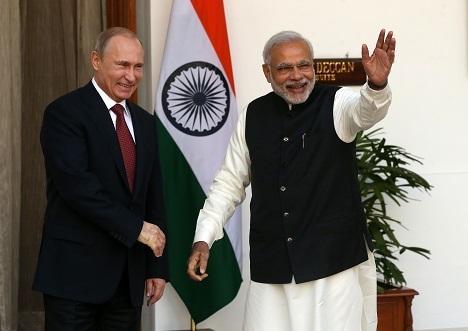 Sources add that Russia’s recent military drills with Pakistan will figure in the private talks between Putin and Modi. A total of 18 documents are expected to be signed between Russia and India during the summit. The eight annual BRICS Summit will be held immediately after the Indo-Russian summit. No big-ticket economic announcements are expected in this year’s edition, but the countries are looking at moving ahead cooperation in a wide range of areas. The members are expected to sign a deal on simplification of customs procedures to facilitate trade. They are also expected to set up an agriculture research platform. The countries are also expected to make a commitment to protecting the environment that includes several joint measures. Experts see the summit as an opportunity for members to strengthen bilateral ties. Several bilateral meetings will be held in the sidelines of the BRICS summit. Tung adds that the future course of action of BRICS will also depend on Brazilian Michel Temer’s approach towards the grouping. His predecessor Dilma Rouseff was eager to make BRICS a political grouping. “Reports suggest Temer wants to strengthen BRICS as an economic force,” Tung says. Brazil sees the BRICS Summit as an opportunity for the government to show “a new Brazil” of “investment opportunities, stability and fiscal responsibility.” Alexandre Parola, Temer’s spokeman told Agencia Brasil. The main declaration of the BRICS summit will be made on Oct. 16. The BRICS countries have a combined population of almost 3 billion people. Their total GDP is around $17 trillion.